Contour Mouse, once known as the Perfit Mouse, is an ergonomically sculpted mouse, designed to support your hand comfortably, regardless of size. Over 120 different models were designed until we found the perfect fit for your hand. This design is the perfect balance between ergonomics and productivity. Four right-handed sizes and two left-handed sizes ensure that you will find a Contour Mouse that fits your hand perfectly. This is important for avoiding excessive clutching and finger flexing that can aggravate the hand and wrist, resulting in repetitive strain injuries. Contour Mouse has five buttons, including a proper, full-size third (middle click) button. The three major buttons are elongated so that your fingers rest on them and are able to click with full finger extension with small, subtle motions and without flexing your fingers. Your thumb rests on the side, between a rocker switch and the scroll wheel on the side of Contour Mouse. Contour Mouse was introduced in 1995. During its development, over 120 different models were designed until we found the perfect fit for your hand. 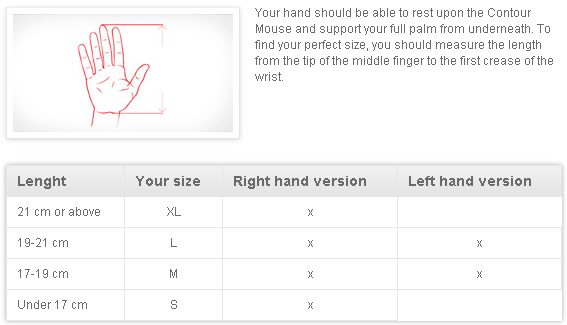 It was launched as Perfit Mouse as an abbreviation for Perfect Fit. Even if technology is moving fast, our hands don't change. That's why we hold on to the successful form factor for Contour Mouse, because it still helps to stop and prevent repetitive strain injuries such as Carpal Tunnel Syndrome and Tendonitis. In its fourth generation, Contour Mouse has now been updated with a new, grey metal colour. On the inside, the electronics have been updated, and the precision has been increased to 1200 dpi. A pronounced arch on the top of Contour Mouse gives your hand support from underneath. The specifically designed arch fills the hollow of your palm and allows you to rest your hand on top of the mouse. This promotes straight alignment of your hand and wrist while slightly elevating your wrist from the desk. Contour Mouse has elongated buttons that allow you to use the second knuckle of your finger to click. When you use this (instead of your fingertips), you use a stronger, thicker tendon with small, subtle motions and automatically avoid flexing your fingers. As one of the few computer mice on the market, Contour Mouse offers a proper, full-size third mouse button, making middle clicking as easy and smooth as a regular click. The option of having a frequent command by a finger click is a smart feature for high-click-intensive tasks such as CAD/CAM, layout and banking. Your thumb rests naturally on the side on the Contour Mouse, where you have both the scroll wheel and a rocker switch (performs "back" and "forward" in most browsers). Contour Mouse automatically offers a relaxed grip - where the hand rests on top, and the fingers lie relaxed and stretched out. It is optimal for everyday mouse operations and it allows you to move the mouse with the full lower arm. If you need to focus on detailed precision work - which is often combined with high cursor speed - you can switch to a precision grip, where the mouse is held with the fingertips of all five fingers. Remember to return to the relaxed grip as soon as possible. 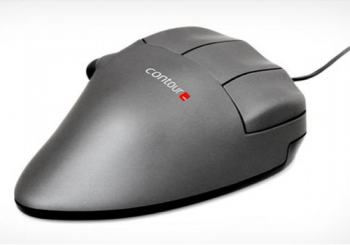 Contour Mouse Is available in four right-handed and two left-handed versions. When you find the size that truly fits your hand, you increase both comfort and control. Contour Mouse makes ergonomics a possibility for left-handed users - and it's available in two different sizes. Our design team concluded that a slight pronation angle of 17 degrees - in comparison to a more vertical angle - was the perfect balance of ergonomics and productivity. 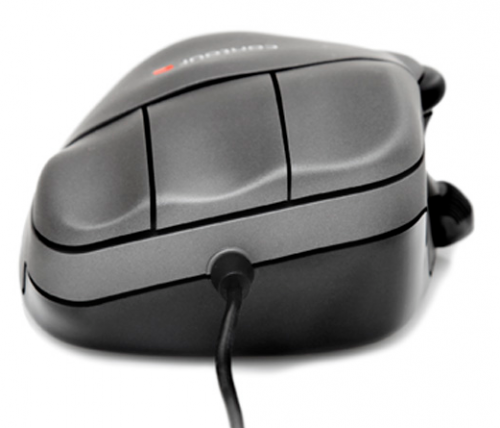 This neutral tilt of Contour Mouse relieves pressure on the forearm while still minimising the grip force. Convenient, out-of-box connectivity for both PC and Mac computers. This HID compliant device has the drivers "on board" and simply needs to be plugged into any empty USB port.